In an earlier post here in Educational Technology and Mobile Learning I talked about the 8 elements of the critical thinking process and I argued that critical thinking is a cognitive process that requires disruptive patterns of thinking, ones that question the status quo of propositions and leads to the creation of alternative lines of reasoning. 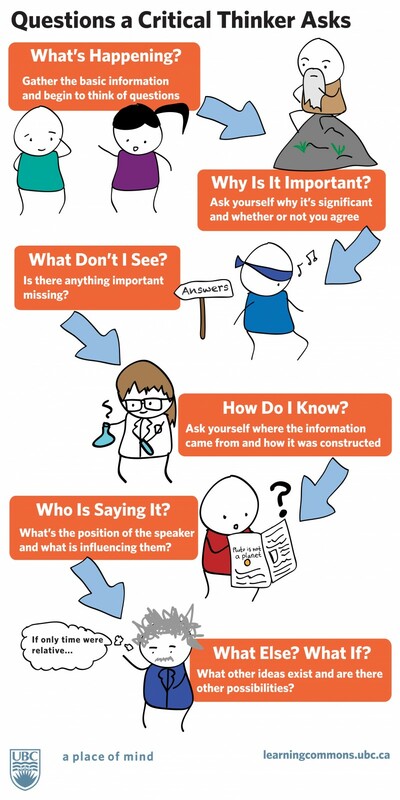 Today I am adding to this discussion this beautiful visual created by Learningcommons which features the 6 questions a critical thinker asks. This could be used as a poster in your classroom to remind students of the kind of questions they need to ponder about and develop. Have a look and share with your colleagues. For more resources, toolkits, sheets and other materials on critical thinking, visit this page. Follow Educational Technology on : Twitter, Facebook , Google plus, Pinterest .